Wondering when your baby can start eating solid foods, drink water, use a sippy cup, or sit in a high chair? OXO has the answers. Read on for your essential guide to feeding baby at every stage. 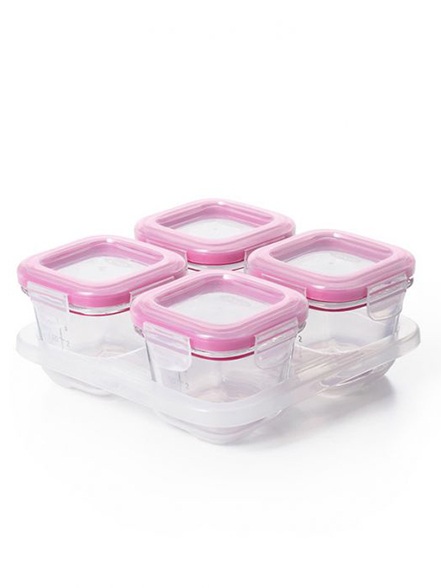 If you thought the breast-or-bottle dilemma was a head-scratcher, get ready for a whole new set of questions about how or what to feed your baby. The Googling and asking-around have only just begun! To answer the most common questions that parents wonder about, we talked to Tiffany Fischman, M.D., a pediatrician at Children’s Hospital Los Angeles. All of the baby-feeding tips and timelines here come from Dr. Fischman, since we know that for questions as important as how to feed your baby, it helps to go right to the source: an experienced pediatrician, who also happens to be a mom of two herself. Q: When can babies start eating pureed baby food? Once your baby has doubled his birth weight and weighs 13 pounds or more, he’s likely ready to start eating pureed baby food. TIP: Single-ingredient pureed fruits, vegetables or grains are among the best first foods for a baby. 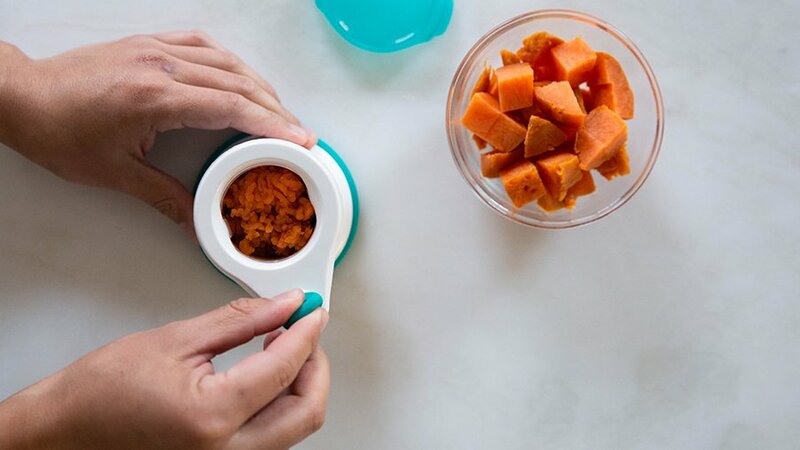 Most fruits and veggies need to be steamed or baked until they’re super-soft before getting put through the baby food mill. You should wait a few days after you introduce a new food, to see if your baby experiences sensitivities, says Dr. Fischman. Q: When can babies try potentially allergy-causing foods? It’s safe—and smart—to offer your baby soft eggs, dairy, soy, peanut butter and low-mercury fish early. (Puree all foods prior to six months.) “Offering foods that are potential allergens can actually help decrease a child’s risk of developing an allergy later,” says Dr. Fischman. TIP: If your baby has eczema, a history of a specific food allergy or a very strong family history of food allergies, discuss a safe food plan with your pediatrician. Q: When can my baby use a high chair? 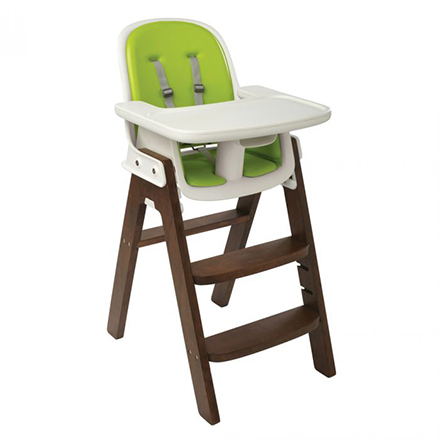 While every baby is different, many high chair manufacturers (OXO included) recommend waiting until your baby is six months old before introducing the high chair. You’ll know she’s ready when she can sit up with limited support. 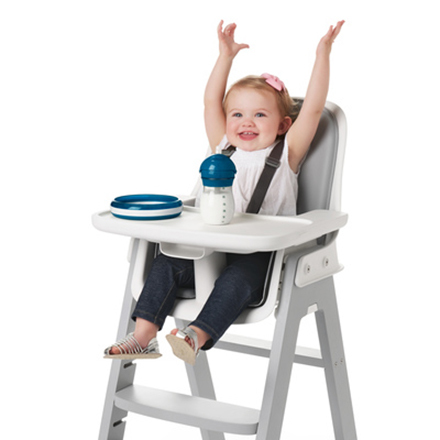 TIP: Once you set up a high chair, have her sit in it for short bursts—before you start using it regularly—so she can get used to the feeling. Q: When can babies try using a sippy cup? 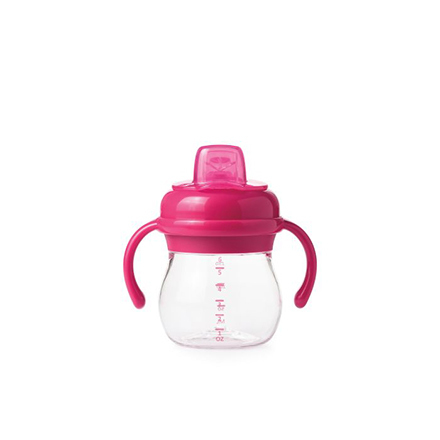 Babies are usually able to bring their hands together and hold an object to their mouths by six months—a skill they need in order to drink from a sippy cup. Q: When can babies drink water? 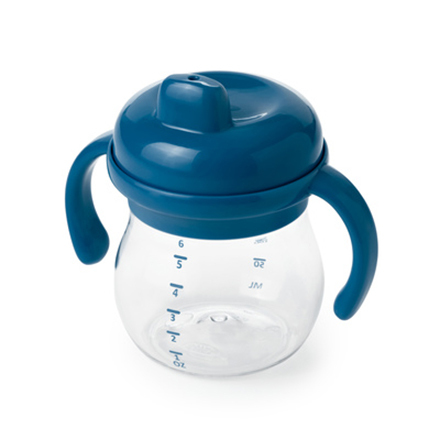 You can offer a sippy cup containing a small amount of water a couple of times of day. At this age, however, keep intake to just a few sips. “Babies still get most of their nutrition from breast milk or formula, which also fills all of their hydration needs,” says Dr. Fischman. TIP: After 12 months, your baby can drink water more regularly, alternating with cow’s milk or breastmilk. Q: When can babies eat chunky purees or foods with a more solid texture? Chunky mashed-up bananas, avocado and sweet potatoes are all great foods to try at this age, as are soft scrambled eggs. 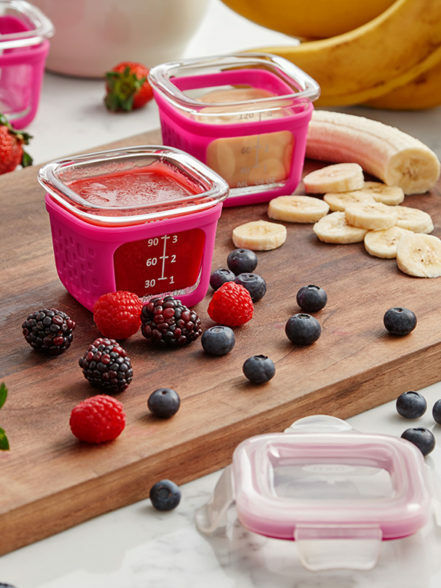 TIP: Once your baby gets a handle on eating smooth purees and is ready for more texture, make your food prep routine easy with the help of a food masher. 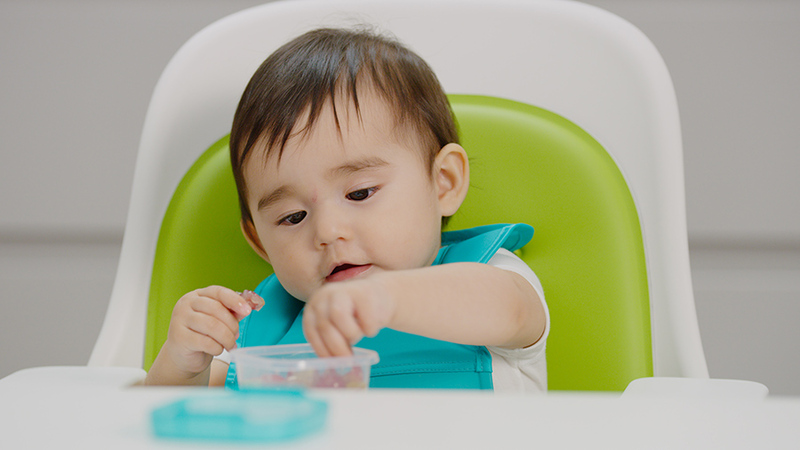 Q: When can babies try finger foods? When your baby reaches for the food you’re feeding her—and the food on your plate, too—she’s giving you signs that she’s likely ready for finger foods. TIP: Offer your baby cooked veggies chopped into small pieces. You can also offer peas, raspberries, chopped banana—and chopped or mashed meat and beans, too. Q: When can babies try using a “grown-up” cup? “At about a year old, children are often ready to use training cups that more closely mimic a regular cup,” says Dr. Fischman. 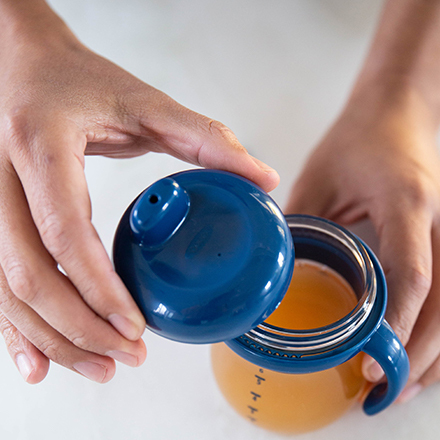 TIP: Look for an open-top transitional cup with special inserts that are designed to control the flow, while still helping your child learn a big-kid skill. Q: When can babies start drinking cow’s milk? You can start transitioning your baby to cow’s milk at the age of one. Limit consumption to less than 24 ounces a day, since more than that can lead your baby to fill up on milk and not get enough nutrients from other foods. TIP: “Whole milk is best because it’s a good source of fat and nutrients, which are important for baby’s developing brain,” says Dr. Fischman. Q: When can babies have honey? Honey contains spores that can cause botulism in babies. The very same spores, however, are harmless to adults and children over the age of one. TIP: For kids over the age of one, honey is a kid-friendly cough-suppressant. Q: When can babies drink juice? Babies and toddlers don’t need juice. The American Academy of Pediatrics recommends that you avoid giving it to babies younger than 12 months, since it doesn’t add any nutritional value to their diet. (Fresh fruits are a better choice when babies are ready to eat solids.) After children turn one, offering the occasional 100 percent fruit juice treat is OK. TIP: Offer no more than four ounces a day and avoid serving it in a bottle, which can lead to tooth decay. 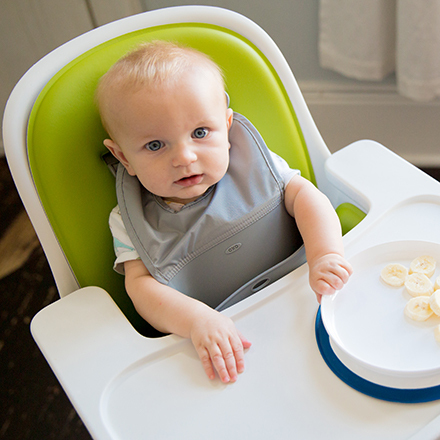 Visit OXO’s blog for more tips on what to feed your little one.